It feels like it was a mere few weeks since I read the first Badger, the Mystical Mutt book, and here its authors McNicol and Jackson are intimating they’re on book number six! I suppose I have to believe them. It’ll be in my best interests to be on good terms with literary Scotland, so let’s celebrate Badger’s sixth publication day on this 2014 Walpurgis night. 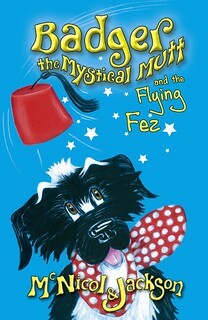 He’s throwing a party in Badger the Mystical Mutt and the Flying Fez. It’s Old Year’s Night and he wants to gather the whole gang. But he’s missing his spotty ‘Chief and things aren’t going well. There is the foggiest fog Badger has ever seen (although I would say it’s unlikely you would see anything in such foggy circumstances). This is where a very naughty Fez called Otto appears and tries – pretends – to help. Most of the gang is also present, and everyone does their bit. Pickle is upset because she is missing someone special, but that’s what you have friends for. And the Badger books are there to show what friends are for. Even the Dog Catcher seems to be friendly. Or is he? Perhaps Old Year’s Night is a time for change. This is a Badger book, so you can rely on things being sorted out, despite Otto doing his worst. So, there I was, in the back seat of Fledgling’s Clare’s very comfortable Kia, on the way to Philip Caveney’s book launch, when the Plague Doctor jumped in and sat next to me. He had a stick. (In fairness I have to mention he didn’t use it.) It’s just that by then I’d sort of forgotten he was meant to be there. I have to say I timed it well. 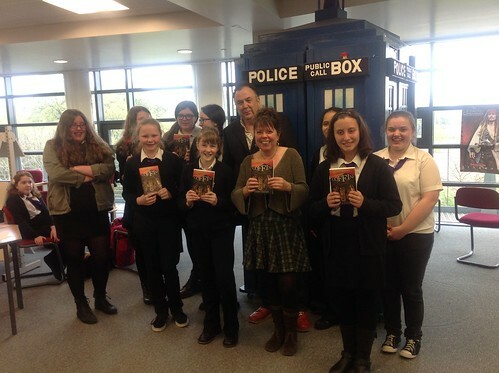 A mere four days into the Scottish Bookwitchery and there was a book launch to go to. A bit weird that it was for another Stopfordian, crossing the border for some adulation. (I reckon Philip will have to join me here soon. Scotland is his kind of place.) 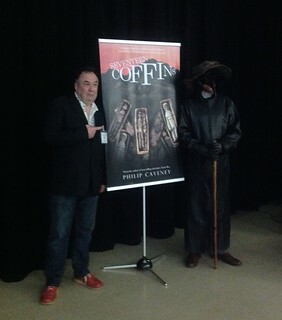 When I heard he was having a launch for Seventeen Coffins, I really wanted to go, so a big thank you to Fledgling Press and the Holy Rood High School’s marvellous librarian, who let me. And when Clare emailed to offer a lift, as she ‘was going to pick up a Plague Doctor on the way,’ I felt it was an opportunity not to be missed. It’s not the kind of phrase you come across very often. As for meeting Plague Doctors, I suppose I’d hoped we’d seen the last of him, what with how things went in Crow Boy, but that certainly turned out to be wrong. So, there we were. And when we arrived at Holy Rood, at the foot of Arthur’s Seat (well, almost) where the action in Seventeen Coffins begins, we were taken into the school’s library, which must have the most breath-taking view of all school libraries, not to mention a very cool librarian (I want her skirt! ), where we all fell over each other admiring their very own Tardis. I mean, how cool is that? Clare and I had colour co-ordinated to match the school’s colours. We were both purple. The hall – with purple seats – filled up with 200 pupils, who heard their librarian tell them Philip’s book is so good, it made her forget the previous day’s dreadful football results. Reading from Seventeen Coffins, when Mancunian hero Tom meets Edinburgh real boy Daft Jamie, Philip told his audience that he has hidden three copies of the book somewhere on Arthur’s Seat. Get out there and look! He also launched a competition for the best explanation for the coffins; who put them there, and why? The best three will win a copy of the book. And for the Q&A there were two more books on offer; one for the first question (great way to get an audience going!) and one for the best question. There were so many hands in the air, and so many questions, also in the air, that Philip had to point out ‘we’re getting a bit rowdy, folks.’ I reckon that’s just how he likes them. You want a book launch to be lively. Clare Furniss has written about an insufferable heroine, someone you would cheerfully throttle, were she not a fictional character. 16-year-old Pearl has so much, and you just want her to stop wallowing in self pity. Because the ‘only’ thing she doesn’t have is the mother who died giving birth to Pearl’s baby sister, Rose. Now, I’m not belittling the enormously harrowing experience of losing your mother. It’s just that so many people, fictional or otherwise, lose parents and suffer some other dreadful problem as well, and come out of it fighting. Pearl wallows, and she does it well. She has a lovely and loving stepdad, a rather rat-like new baby sister, a marvellous best friend, understanding teachers at school, a sweet new neighbour, as well as that neighbour’s rather fanciable grandson. Add to that successful GCSE results and an interesting grandmother, and she has everything to try and pull herself together for! Pearl renames Rose The Rat, and has occasional encounters with her dead mum (it’s never quite clear how this is done; perhaps it’s all in Pearl’s head) where they discuss her behaviour. As an adult reader I could see where Pearl ‘went wrong,’ but I’m not sure how obvious this would be to younger readers. Will they see her childish reluctance to take responsibility for her life as natural and reasonable? I guess it depends on which side you are on. It’s easy to feel sorry for yourself, and once you’ve started, it can seem impossible to stop. The Year of the Rat is a fantastic read, about grief and how to deal with it (not like Pearl! ), and should help readers to see that there can be life after death. And not to forget there are others in that life, also suffering. The pram-buying scene is devastating in its unintentional horror. I had intended that to mean the much emptier than usual four weeks I am looking ahead to. But there is that empty feeling you get when you realise – halfway up the M6 – that you have no clothes hangers. What you do have is five suitcases filled with clothes, which know nothing better than to hang. And, when you have cameras and camera chargers, not to mention an iron you won’t need for a while and a hammer and a drill and you had to jettison the mop bucket and the feather dusters, it seems silly (some would say careless) not to have the little camera lead that would enable photos to jump from camera to laptop. ‘Not to worry,’ I thought, ‘I’ll borrow the Resident IT Consultant’s little camera.’ Except he is also missing the magic lead which allows pictures to jump across. This moving business offered nice symmetry, as usual. On moving to Stockport the Resident IT Consultant had cause to stay in the hotel later used by the Stockport Schools Book Award winners. On moving away, we ended up staying there again. So before leaving town I actually stayed where all these real live authors have slept! Our many, many years in Stockport involved Roger Whittaker during the first few weeks. The last few weeks involved other Whittakers. Speaking of food; we had some of that divine spinach and red lentil soup combo on moving day. By that I mean the spinach soup, and the lentil soup leftovers from the recently thawed freezer, which I threw together into pan and heated up, which we had for lunch, along with a piece of nan with melted cheese all over. I suspect I’ve not eaten anything as lovely since that cheese and tomato sandwich I had at Liverpool Street station in 1966. Once we had limped along the M6 and the various M74s and 73s and whatever else they have up here, we were met by the Grandmother – whose spare room has temporarily replaced the full Bookwitch Towers – and a pile of post. Her postman doesn’t yet realise the force that has been unleashed on him. One picture book arrived by other means, all on its own in an enormous cardboard box, which the Grandmother had to wait in specially to receive. Being surrounded by all these superfluous items desperately wanting to be re-housed, at least we we were able to find good use for the box, which is empty no more. It’s OK not to be purple with shiny scales. Even if you’re an orange dragon with sticky-out scales, all is not lost. There is bound to be some princess out there who needs you. Even princesses can be a little different, sometimes. 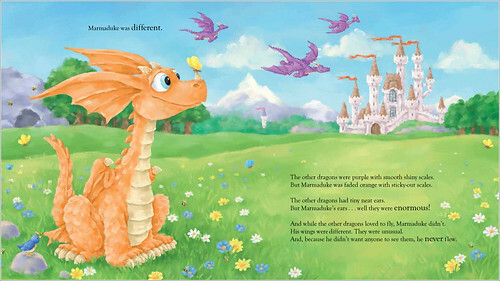 At first Rachel Valentine’s story Marmaduke the Very Different Dragon, with rather orange illustrations by Ed Eaves, struck me as too ‘princessy.’ But when I read it I realised it’s actually rather sweet. Marmaduke finds himself an unusual princess, who is just right for him, and that makes both of them very happy. Let’s leave the perfect purple dragons to the perfect little princesses who need protecting. Marmaduke’s Princess Meg is a brave girl, and she doesn’t need to be protected. As I was saying the other day, I took my time over reading Forge. But that was probably for the best, as I was much better prepared for The American Revolution by now. I haven’t read much fiction set during this period (apart from Chains, the first book about Isabel and Curzon), and looked at from my comfortable perspective 200 years later, I always reckoned America ‘simply freed itself.’ You know, because it wanted to. Chains was mostly Isabel’s story, and Forge is more about Curzon. They have finally escaped, but things don’t go well. Curzon ends up enlisting to fight for the Patriots, and most of the book is set in Valley Forge, where George Washington set up his headquarters. Black soldiers were unusual, but not as rare as you might think. So when the soldiers freeze and starve and nearly kill themselves just trying to survive the winter of 1777-78, at least white and black suffer equally. It’s not even only the poor, as many better off men fought for freedom from the King of England as well. On the other hand, the leaders at Valley Forge have food to eat, and beds to sleep in. 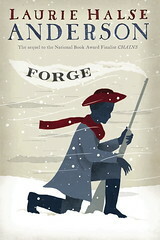 Forge is mainly about Curzon and his fellow soldiers, and about being black and being a slave. Neither Curzon nor Isabel are as free as they would like, and far too many people believe slavery is perfectly all right. 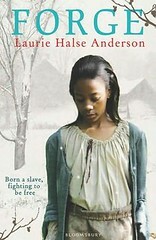 Laurie has put a lot of real people and real battles and real conditions into her book. It’s actually quite interesting to find out that so many of the characters were not made up, and that those who were, were based on real people. Each chapter begins with a quote from something written by leaders of the revolution, as well as by soldiers and others. Maybe there is a lot of young fiction about this period in America. I hope so, because it’s an interesting time. In a way it’s surprising I’ve not come across a lot more, unless very little has actually been written. Remember my appalling reading habits when I was young? Well, here is a glowing example of what the perfect parent should do – according to Bookwitch. 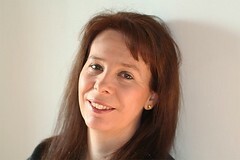 Author Helen Grant makes me green with envy. I’m hoping that now that I will be living closer to her, some of her excellence might rub off. ‘I read to my teenager. I didn’t think there was anything particularly noteworthy in that, until the Bookwitch wrote and asked me whether I would be prepared to do a guest blog about it for her: what I read, how I find the time, and also something about the fact that the teenager in question is prepared to listen to me reading. I started to think about the topic a bit and it is perfectly true that when you think “bedtime story” you don’t think “mum and teen.” You think of sweet little shock-headed toddlers who have to be read to, because they can’t read themselves yet, or primary school kids who like a reassuring half-hour with mum before bed. Hey, look at the music video for Ylvis’ What does the fox say? – how old is the kid sitting on his grandpa’s lap, do you think? Four, maybe five years old, tops. What you don’t imagine is gramps reading to 170cm of gum-chewing teenager in a hoodie. So how come I’m doing it? It’s a long story. My daughter made her appearance in the world almost three weeks late, and I have often wondered whether it was missing that three weeks of thrilling outside world experience that made her so darn sleepless as a baby. I know all mums think their darling is special, but I really am convinced that I had the wakefullest baby ever. She resisted sleep at all costs, maintaining instead a kind of squirelly perma-attention that would continue until she was screeching with tiredness. Car drives and being carried around in someone’s arms would make her drop off (eventually) but it can be difficult to prepare meals whilst driving a car or carrying a baby. Another solution had to be found. By trial and error, we discovered that reading aloud would make her go to sleep. I suppose it was the reassurance of a familiar voice without too much interaction: no coochy-coo, who’s a nice baby then? – more, I read, you listen. As she was too tiny to know or care what the reading matter was, we chose our own. My husband read her Heinrich Harrer’s mountaineering classic The White Spider; I read her Captain Corelli’s Mandolin (another of those cultural experiences she was too young to remember later, like visiting every single Antoni Gaudi building in Barcelona). A few terrifying crevasses or paragraphs of war-torn love and she would be fast asleep. Over the years that followed I often read to her and her little brother. Greater love hath no mother than this, that she readeth every single volume of Beast Quest, believe me. I discovered that the classics are still the best. Beatrix Potter’s language is so flowing and elegant that it can be read accurately even when the person reading is three-quarters dead with exhaustion. Eventually, of course, both kids learnt to read themselves, and were able to pursue the time-honoured custom of covert under-the-bedclothes reading after lights out, whilst I put my feet up – or more probably, emptied the dishwasher. Reading aloud was relegated to one of those things we did during particularly long car journeys or intolerably wet days on holiday. Over the last couple of years, however, we’ve started it again. My daughter is a voracious reader, so she doesn’t really need any encouragement to get through books, but she did need some help with sleeping. The dawn of the teenage years seemed to have restored her to factory settings, so to speak: all of a sudden she was having problems sleeping again, resulting in exhaustion in the mornings. Sitting up late at night in front of a bright screen – whether tv, computer or hand held console – is not a good recipe for sound sleep. Science says all that artificial light close to the face fools the body into thinking it is still daytime, and delays the production of the hormone melatonin, which helps us fall asleep. Trouble is, if you are bright-eyed and bushy-tailed at 11pm it is difficult to lie patiently in a darkened room waiting for the elusive sleep to arrive. I suggested reading to her again. And that is what we have done. 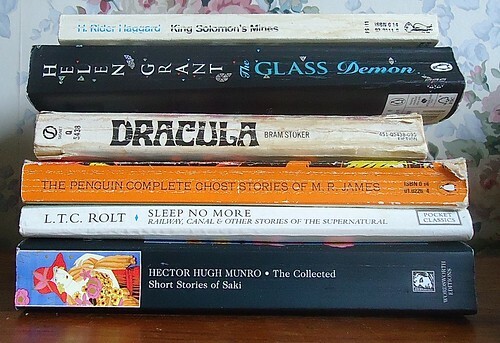 We started off with The Hound of the Baskervilles; since then we have also done King Solomon’s Mines, The Lost World, Dracula, The Chrysalids, The Werewolf, Carmilla, my own novel The Glass Demon, and various short stories including those of Arthur Conan Doyle, Saki, M.R.James and L.T.C.Rolt. We choose the books between us. I think this is pretty key to the teen-being-prepared-to-listen bit. 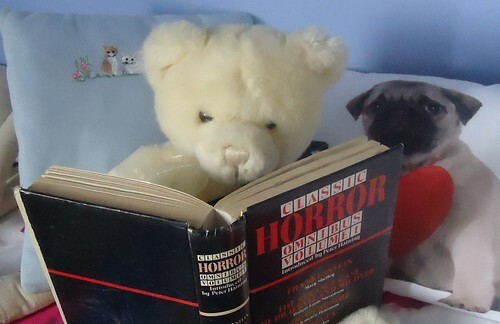 It helps that we share a taste for thrilling and creepy stories. If she wanted me to read her endless romances I would still read them, but I’d be reading between clenched teeth. We’ve also tended to go for stuff she might not tackle on her own: Dracula, for example, is easier if you have someone ancient on hand to explain what telegraphy, collar studs and hansom cabs are (not, I hasten to add, that I actually remember those things!! ).